I'm always hopeful that leadership will change with the times. I change with the times. It's very hard to be a teacher if you aren't willing to adjust. People tell me, hey, things were different twenty years ago, and they're always right. I'm more careful than I was twenty years ago. I've become chapter leader, and I'm hyper-aware of what can cause issues. I've probably written this before, but I distinctly recall a student who reminded me very much of my daughter. She asked me a question, I have no idea what, but I remember saying, "No, sweetie, it's not," while thinking, "Oh my gosh, I'm going to the rubber room." The student took the word as I meant it. There was no complaint, we got along fine for the rest of the year, but I never called her "sweetie" again. It had just come out of my mouth that day. I found ways to be kind to her without using that word. It's kind of what we do, or at least what we hope to do. She was a great kid, and she's grown into a great adult with a great kid of her own. Let's talk change a little more. For years, I've had this impression of 52 Broadway as some kind of impregnable fortress, where no matter what happened, new ideas never got in. But I'm seeing cracks in the no-new-idea force-field lately. Some of them I cannot share here, but here's one I can. UFT President Michael Mulgrew, who a few years back was ready to defend Common Core with fisticuffs, has an op-ed in the NY Daily News opposing high-stakes testing. This is remarkable because I remember UFT officials defending the tests, saying that minority communities liked them. I also recall Unity handouts full of nonsensical criticism of those of us who supported opt-out activism. Now, this all seems in the past, and Michael Mulgrew is alluding to Campbell's Law, which is usually done by people like Diane Ravitch (and yours truly). Campbell thought that all this pressure would lead to massive corruption, and indeed we've seen that. Decades ago, I knew for a fact that a former supervisor would take all the ESL state tests and sit and erase and adjust them until they suited her needs. More recently, such things have led to scandal. And closer to 2018, Eva Moskowitz sheds most of her "scholars" before graduation, ends up with a few dozen or so, and declares 100% success, even though public schools graduate a higher percentage than she does. I would like that, actually. The tests they use to place the kids I serve are abysmal. What they've done is promote everyone to levels higher than they should have. As a result, I no longer have two classes of beginners in the largest high school in Queens. Instead they're promoted, Many students who would benefit from my beginner class are sitting in my advanced class, saddled with reading a novel and a whole lot of writing. I'm stuck preparing them for the English Regents exam, which none of them should be taking. I'm very glad, though, to be part of a union that will support a parent's right to opt out of ridiculous tests. Perhaps we can now stand in solidarity with the amazing grassroots activists on Long Island instead of sneaking around corners and hoping they don't see us. Maybe we can take our whole union in an activist direction and fight for sanity in this preposterous era of mandated corporate testing for Other People's Kids. I'm not entirely in sync with Mulgrew. He concludes we deserve credit for increased reading scores in NYC. Hey, I'm glad to take credit for whatever if I get half a chance. But a good part of his column is devoted to inconsistencies in testing. As someone who stands in front of misplaced students every working day, I can tell you that the tests mean nothing, at best. More likely they mean less than nothing. There's an expression, "He knows the price of everything, but the value of nothing." That's kind of how I see testing. The state can make up stakes and consequences for testing. They can change the pass rates to make Michael Bloomberg look like a genius if they're high, or make NYC teachers look like a bunch of losers if they're low. There's one conclusion both Mulgrew and I have in common--the tests are gamed by the state to look however they want them to. As such, they're thoroughly unreliable. I'm not a testing expert, but I know exactly what goes on in my classroom. 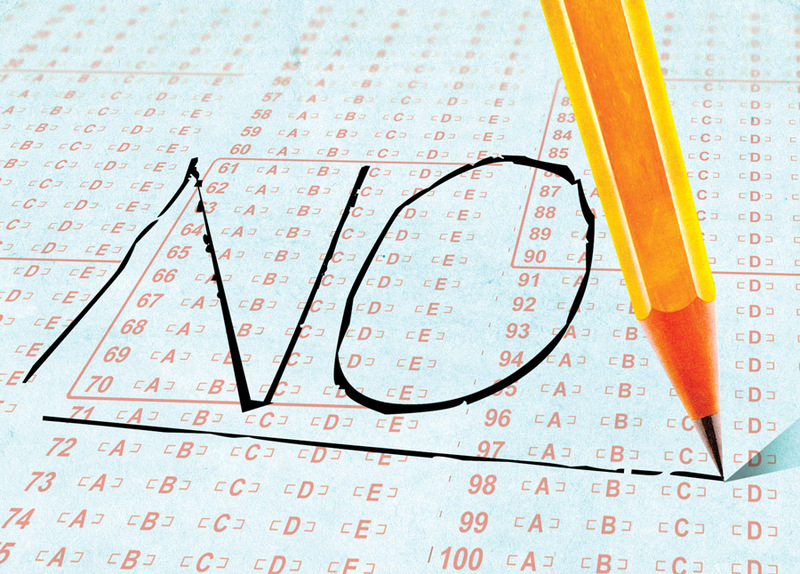 When I give a test, it's to see whether or not students are getting what it is I'm teaching. I'm not trying to prove the class is good or bad. And whatever the results, I can go over the test, with the kids, to try and make them understand a little better for next time. I can stress problem areas and gloss over things everyone understands. 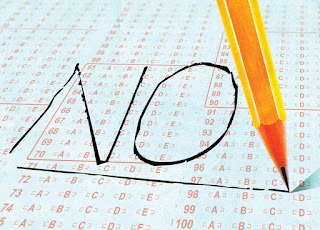 As Mulgrew said, kids never see the state tests, and never know what they got right or wrong. It seems they never learn from them, short of a likely as not arbitrary score. I don't understand the obsession with quantifying everything. I don't understand why we can't leave judgment of progress, or lack thereof, to teachers. I do understand why Merryl Tisch passed a regulation that we can't grade the state tests of our own students. She thinks, because she and the other Regents are crooks who juke the stats, that each and every one of us is a crooked cheat too. But we're not. It's our job to assess students. If we can't do this without the help of the big shots in Albany, I don't know why they even hired us. I'm particularly mystified, given the terrible job they've done up there, why they can't just dump their pointless and unreliable tests, get out of our way and let us do our jobs.